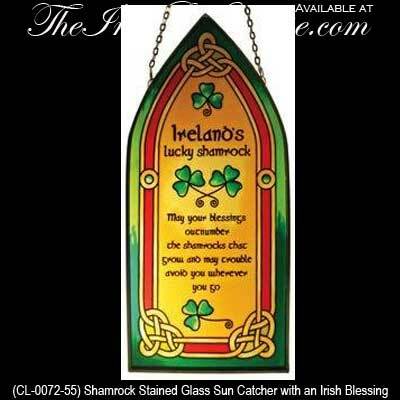 This stained glass Irish plaque is ideally hung in your window as a suncatcher; a metal chain is included. The Celtic stained glass suncatcher features an Irish blessing along with shamrocks and knot-work. The shamrock suncatcher is made of metal and glass and it measures 4" wide x 8" tall. This Irish stained glass is made in Ireland by Clara and it is gift boxed with shamrock and Celtic knot history cards, complements of The Irish Gift House.